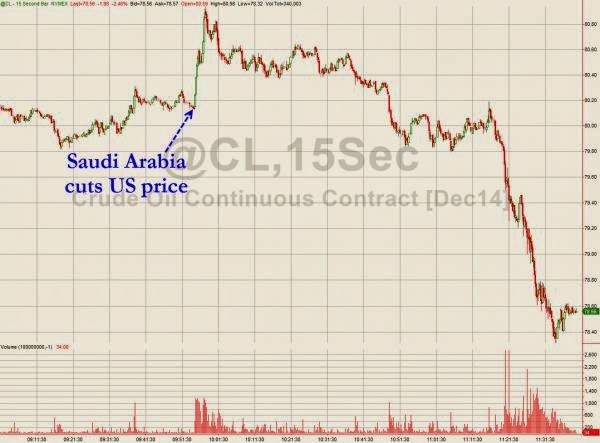 Saudi Arabia, the world’s biggest oil exporter, is telling the market it won’t cut output to lift crude back to $100 a barrel and that prices must fall further before it does so, according to consultant FACTS Global Energy. Swelling supplies from non-OPEC producers drove Brent crude into a bear market on Oct. 8 amid waning demand from China, the world’s second-largest importer. The Organization of Petroleum Exporting Countries meets Nov. 27 to consider changing its production target in the face of the highest U.S. crude output in almost 30 years. “Production of shale oil in the U.S. will not be hit as hard as the Saudis think” by the price decline, FGE Chairman Fereidun Fesharaki said at a conference today in Doha, Qatar. Producers in the U.S. “can withstand a lot of pressure” by reining in their operating costs before they curb investment in new wells and production, he said.